Wanaka, New Zealand – New Zealand’s Cardrona Alpine Resort will install a new NZ$10 million “chondola,” a lift that combines gondola cabins and chairs, in time for the 2017 winter season. The new McDougall’s Express Chondola will be the first cabin-style lift on a ski area in New Zealand, replacing the existing McDougall’s Quad chairlift. The current McDougall’s fixed-grip quad was installed in 1985, and has been a Cardrona stalwart ever since. McDougall’s is the main access point to all of the resort’s beginner terrain, and is kept running very slowly to allow first-time chairlift users the ability to load and unload safely. 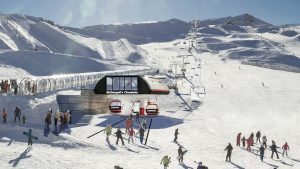 The goal for a new McDougall’s lift is to make it an access lift for the whole mountain and all of Cardrona’s visitors, not just beginners. The new McDougall’s Express Chondola will be a high speed, detachable six-seater chair, with an eight-person gondola cabin between every four chairs. The lift will be a quick access point for the entire mountain, including Captain’s Basin. Gondola cabins and chairs will be stored in the lift’s top station, and can be reconfigured in layout depending on weather conditions. The loading station of the new McDougall’s Express Chondola will be situated 100 meters closer to the base area, making it faster and easier to get up the mountain. The Chondola will increase uphill capacity for McDougall’s by 150% to reduce wait times. The McDougall’s Express Chondola will provide a one of a kind beginner experience in New Zealand, with first-time skiers and snowboarders able to walk on and off a gondola cabin, and ride to the top of the mountain on their first day. From the top of McDougall’s they can access the mellow Skyline trail or New Zealand’s longest beginner trail, A Real Journey, out to Captain’s Basin. Construction on the new lift is expected to get underway next month, with completion in time for the 2017 winter season.